my family came over last weekend to celebrate fathers day... well actually, fathers day was a bit overshadowed this year by my older sister getting married and my mom turning 60 all in the same week. certainly good reasons to host a dinner party! my sister played mixologist and brought over some fun cocktails and the worlds best sorbet for dessert (rachel's ginger beer sorbet from molly moon... my favorite beverage to begin with... turned sorbet! it was out of this world!!) i was responsible for dinner, which is always a pleasure to make for my family of appreciative foodies. the first course was this simple and summery chilled soup. it was certainly a crowd pleaser. with most chilled soups though (except maybe gazpacho), i tend to enjoy just a small serving along with a heftier entree or salad. maybe that's just me. maybe you want a giant bowl of this soup all to yourself, in which case it would make about 2-3 large bowls. for the fam, i made garlic shrimp sauteed in coconut oil and jasmine rice cooked in coconut milk and tossed with toasted coconut flakes... it fit perfectly with this lighter first course soup! combine all ingredients into a blender adding just enough water to get things moving. start with a smaller amount of mint and add more after tasting. you don't want the mint to overpower the flavor of the fresh peas, but let it present enough that it balances with the flavor of the parsley. chill for at least one hour to let the flavors meld. taste again and season to taste with salt & pepper. 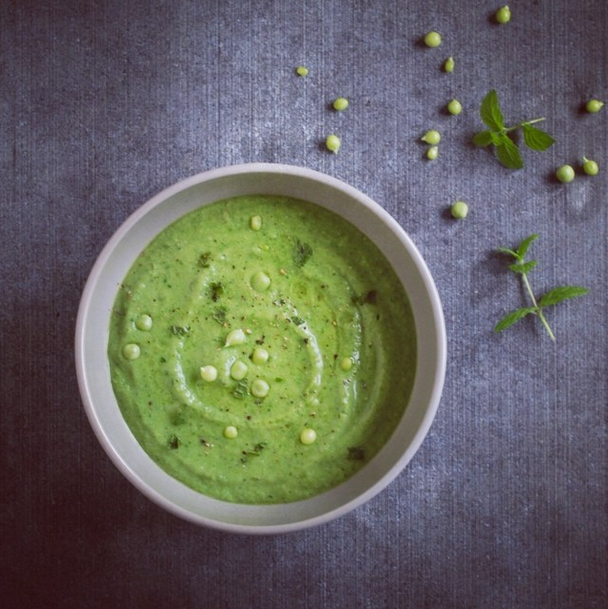 to serve, drizzle portions of soup with a teaspoon of olive oil and garnish with a few shelled peas and torn mint. i could have sworn it was starting to turn seasons in seattle. there was sunshine and warm air, epic bbq parties and cravings for rose. and then suddenly, there wasn't... suddenly i was ridding my bike in the rain... stubbornly without my rain jacket. for weeks, i had been craving smoothies, salads and simple raw foods. but with the turn in weather, i was craving something warm and cozy. something with a touch of heat and two of my favorite spices: aleppo pepper and smoked paprika. cauliflower has grown on me over the years. i've never disliked it, but now it sneaks into my meals fairly regularly and it is just starting to show up early in the season at the farmers market. hurrah! looking at this dish, you'd almost think i had roasted the golden heirloom variety of cauliflower. instead, the rich golden yellow comes from turmeric and paprika - the perfect warming spices for cool summer evenings. this recipe makes a large batch, but could easily be halved. also to note: these spiced roasted chickpeas could be made on their own and thrown into summer salads or eaten as a snack. super tasty! preheat oven to 425. strain chickpeas and place them onto a clean dish towel or paper towel to dry. chop cauliflower into smaller florets. peel and cut onion into large chunks. line two baking sheets with parchment paper (for easy cleaning). on one sheet, combine cauliflower and onions. place dry chickpeas on the second. in a small bowl, whisk together olive oil with spices and salt. divide this mixture and pour half onto the onions & cauliflower, and the other half on the chickpeas. use your hands to mix and coat vegetables & peas evenly. 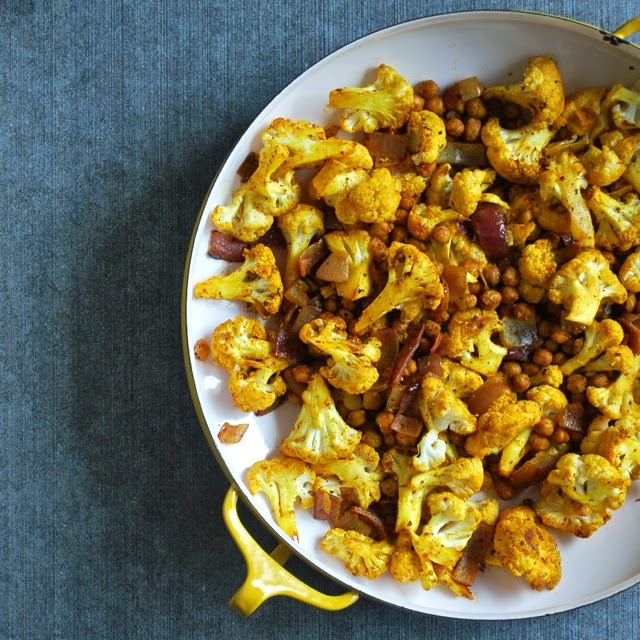 place sheets into the oven and roast for 20-25 minutes, stirring occasionally, until chickpeas are crisped and vegetables start to caramelize and brown. i like to keep the chickpeas separate, because they crisp up a bit more and the vegetables have more room to roast (vs steam in a crowded pan). but once cooked, i combine everything into one large serving dish and top with a dusting of chopped parsley. serve warm or at room temperature. i've previously posted a similar salad, using cauliflower as a base. this variation, is a bit more italian inspired. 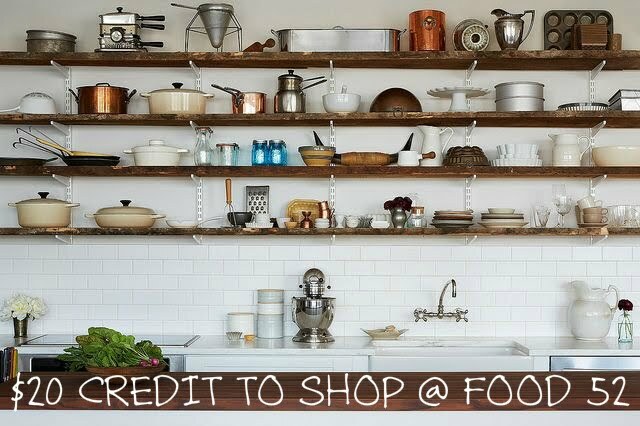 feel free to experiment with whatever fresh herbs and vegetables you enjoy most! note: i used artichokes marinated in brine and herbs. you could certainly used canned artichokes, or artichokes marinated in oil (in which case, perhaps reduce the additional olive oil in the dressing to just 2 tablespoons). if you have a food processor, this recipe will be very simple! you can reuse the food processor to chop each ingredient - however, i would advise against blending everything together all at once as it will become too mushy. this recipe can also be done with a large cutting board, a chef knife and a whole lot of fine chopping. 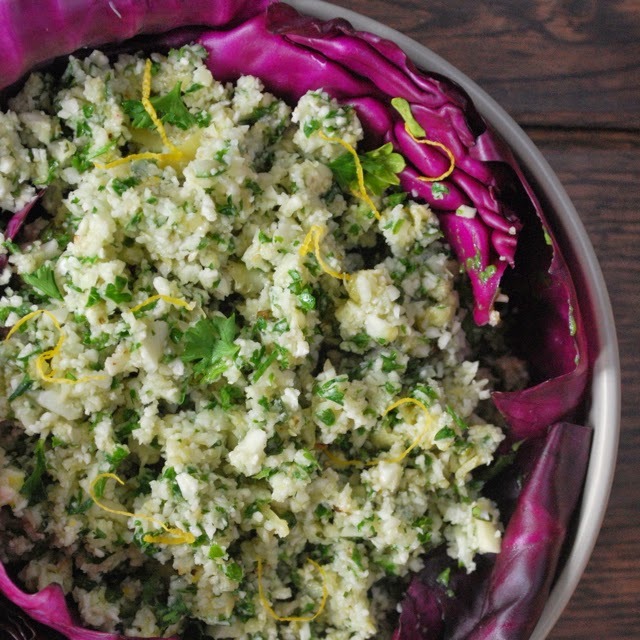 to begin, pulse-chop the cauliflower until it resembles small-grain cous cous. do not over process, as it will turn into a puree. 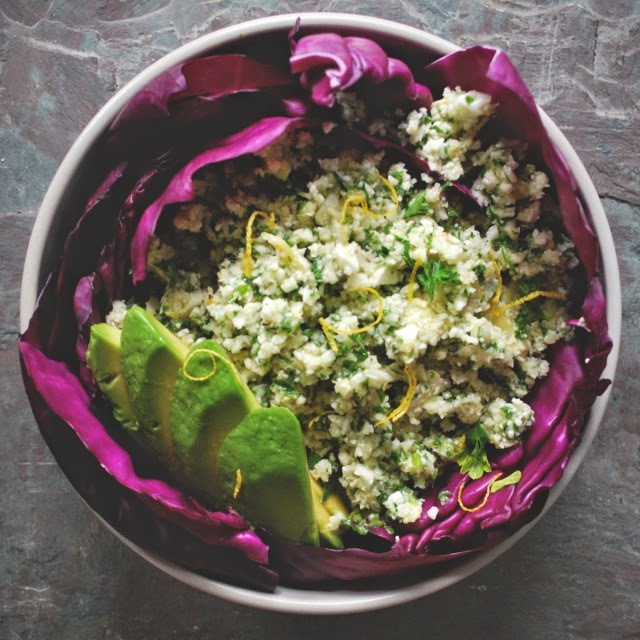 scoop chopped cauliflower from food processor and add to a large salad bowl. de-stem a small bunch of parsley & basil and add to food processor. pulse to chop finely and then add herbs to the salad bowl. back in the food processor, chop the drained artichoke hearts until minced and then add to salad bowl along with remaining ingredients. season to taste. serve with cabbage leaves, avocado, chickpeas or feta cheese. i was very excited last week when my neighborhood farmers market reopened for the season. i took a sunny walk over to the market where i picked up an abundance of beautiful spring vegetables: asparagus, spicy radishes, fresh herbs, spring lettuces, pea vines, micro greens, chives, spring onions, green garlic. oh yessss. so this week, when i was planning the menu for a private dinner party catering, i had to make a run to the market for a haul of fresh spring vegetables to serve! i was especially excited to find flowering pea vines and blossoming chives to add to this beautiful salad. i had to buy some for myself to sprinkle over my eggs and onto my avocado toast each day - they taste just like chives and are incredibly beautiful! in a small bowl, whisk together olive oil, tarragon vinegar and honey. set aside. using a zester, rather than a microplane, zest 1 lemon. this will give you beautiful strands of bright yellow zest. if you only have a microplane, add the grated zest to the dressing. otherwise, save the strands for topping the salad. gently tear lettuces into large bites and place into a large salad bowl. 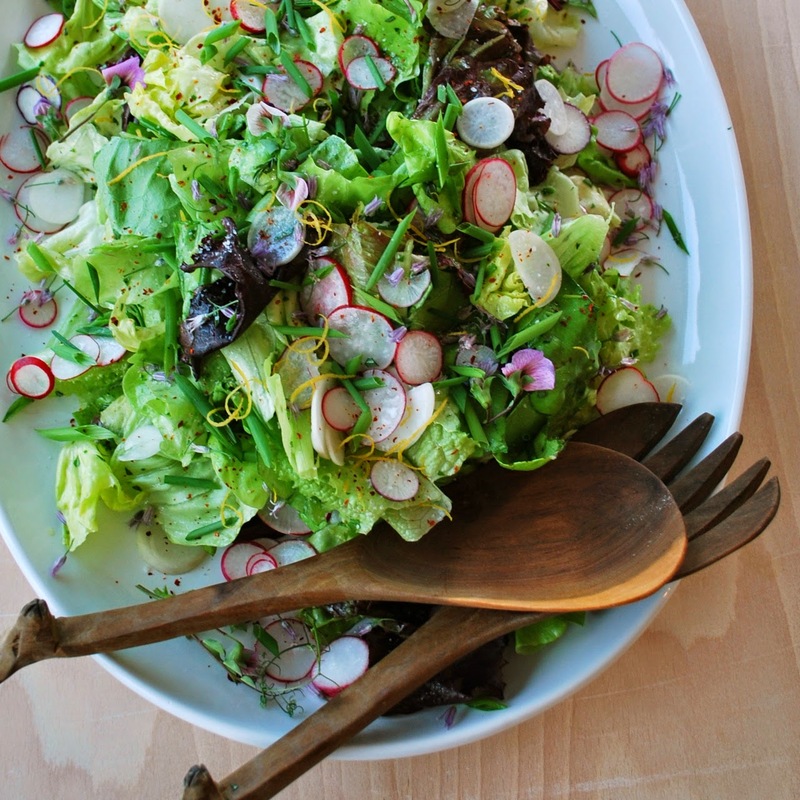 wash and thinly slice radishes and add to the salad bowl along with chopped herbs. toss to distribute the herbs and then add just half the dressing. toss with hands until evenly coated. add more dressing if you desire, adjusting seasoning with salt & pepper. top with chive blossom petals and pea vines flowers and a few additional chopped chives and the zest of one lemon.